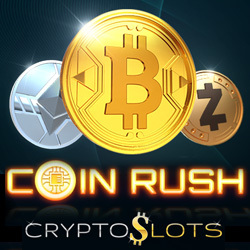 CryptoSlots.com players are crazy about cryptocurrency, so the new crypto-only online casino gives them lots of it in its exclusive new Coin Rush slot game. Gleaming Bitcoins, Monero and Litecoins spin on the new game’s reels and its free spins feature can mean mega-payouts to players’ cryptocurrency wallets. Coin Rush is a 5x4 slot with an extra row that gives extra chances for a winning combination. Scatters can trigger free spins. During the bonus rounds, any extra Scatters increase the free spins, up to a grand total of 99x. The win multiplier increases -- up to 5X -- with each free spin win. Cryptocurrency is ideal for online casino players. Deposits and withdrawals are easy and safe and transaction fees are low. Sign-up at CryptoSlots.com is simple and requires only an email address. Available September 26 – October 1, 2018 only. May be claimed 3X per day. Wagering requirement 37X. Valid for Coin Rush only. Wagering requirement 35X. Valid for all slots except Jackpot Trigger. While other Cryptoslots games can also be found at its parent sites, Slotland and WinADay, Coin Rush is the second game exclusive to CryptoSlots. The other is Jackpot Trigger, a $1,000,000 jackpot game played with tokens collected while playing other games. CryptoSlots.com now has 16 provably fair slots (five with high limit versions), six video poker games and one million-dollar jackpot game. They can all be played on any computer, smartphone or tablet.